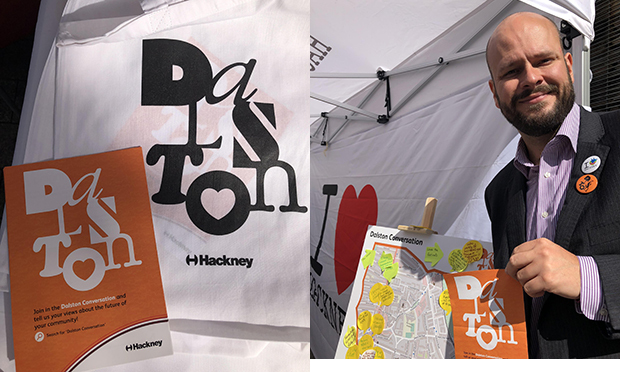 Hackney Mayor Philip Glanville says the council is “taking a step back” from its plans for Dalston as he today announced the launch of an extensive listening exercise on the area’s future. The Dalston Conversation will see the Town Hall gather feedback from the local community on changes affecting one of Hackney’s most popular neighbourhoods, and how they would like to see it develop in the coming years. Residents, businesses and visitors can give their thoughts through the campaign’s new website, and speak to council officers at events taking place throughout the autumn. The council kicked off the conversation with a series of pledges. Two notable ones are to “secure the future of the Eastern Curve Garden” and to “protect and improve Ridley Road Market”. The council came in for heavy criticism over a consultation last year on its plans for Dalston, and later admitted that vague language had led to “strong distrust” in its motives – with residents particularly anxious about the future of the Curve Garden. A questionnaire sent out to people working and living around Ridley Road Market last October also set alarm bells ringing, with some taking it to mean the market’s existence was under threat. As part of the Dalston Conversation, the Town Hall has also promised to “be a champion for existing businesses and culture”, “deliver affordable spaces for local businesses” and “keep and promote diverse shops, restaurants and nightlife”. Reassuringly, it has also vowed to “be honest about plans for the future”. Mayor Glanville said: “Hackney has seen huge change over the last 15 years, with massive investment bringing better education, more job opportunities, new businesses and a transformation in transport links. “But residents in places like Dalston have also been clear that they are worried that future plans might put the area’s heritage and character at risk, or exclude some people from new opportunities. “If Dalston is to remain a place that works for everyone, we need to hear the voices and views of everyone who lives, works and visits here so we can best plan for how to achieve their priorities. The council says people will be able to give broad opinions about the area, whether it is “having a say in what the town centre looks like”, “what kind of buildings can be built” or “ensuring everyone has access to new jobs, education or arts and culture opportunities”. Any feedback will be used to set clear objectives for Dalston’s future, and the council will later publish a delivery plan to show how it will achieve them.